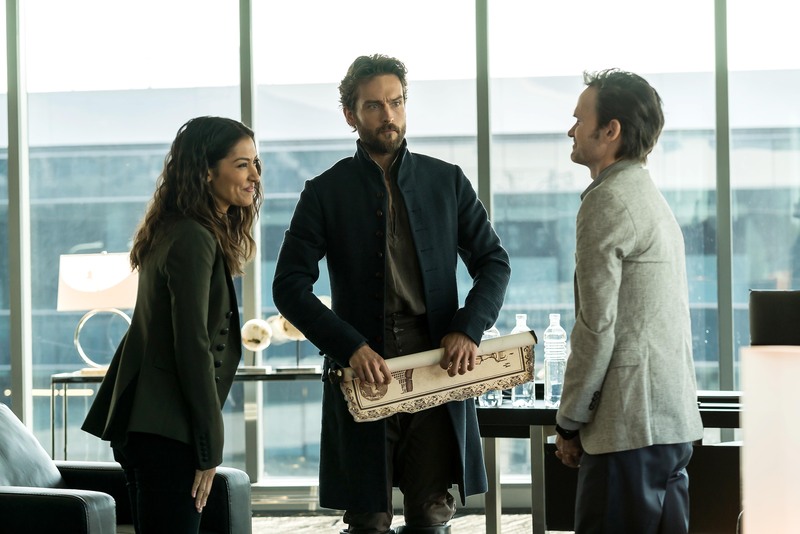 This week’s episode of Sleepy Hollow “Heads of State” has not only a clever and catchy title but has Crane racing against the clock to stop one of his greatest foes and save some of the most important government officials from the chopping block. The episode starts though with Crane facing an even greater adversary—a dusty walk-in closet as he and Jenny are going house hunting in what Joe calls an “edge neighborhood” that is soon going to be filled with cupcake shops and record stores which is, of course, right up Crane’s alley. There are more pressing matters to attend to though, most importantly ripping the band-aid off of the truth that Diana’s daughter Molly is the next witness. It’s clear to the viewers that Molly is the witness—her unexplained drawings of the four white trees which dominated season one, her pull towards Crane and her creepy comment that her mother has a pretty neck, cause you know, the headless horseman is coming to town. But let’s talk about progression. The president in Sleepy Hollow-verse is an African American woman who is ambushed by the headless horseman in her limo. One of the police officers who survived meets with Diana and Crane and explained the craziness he witnessed. Diana is more open to the idea of the supernatural raining down on D.C. so she believes Crane when he warns her of the threat that the horseman holds if he is after the POTUS. More specifically, her head. The heads of state used to be considered mystical, so it’s no surprise that the horseman is after a mythical head to possibly replace his own. Something stopped the horseman though; a barrier created by glyphs in the underground tunnels prevented him from taking the POTUS’s head. It turns out that civil rights activist and freed slave Benjamin Banneker was involved in making the glyphs. Of course when Crane was talking about meeting Banneker, it reveals everything because Joe is an expert on Banneker and knows that Crane was lying when he was trying to attribute his knowledge on papers that burned during the 17th century. So Crane is outed as a “man of time” destined to defeat the four horsemen of the apocalypse as a witness. Diana is not happy that Crane was keeping secrets, but she lets it go since he’s saved her life a bunch of times already. Not all of Banneker’s papers burned though, one leather folio survived and is in the hands of our creepy villain Dreyfuss, who admits that he’s a “freak for the freaky” and his demon-eyed lackey. Dreyfuss jokes with them that he sold his soul to the devil when he was 25, making small talk about his interest in the supernatural, but I have a feeling that the joke is more on the side of the truth. Once they get the folio, Dreyfuss explains to them about the mysterious J-Street, which isn’t supposed to exist in D.C., but of course it does and can trap supernatural entities. With their plan set in motion, Diana picks the perfect time to bring up Molly’s sketchbook of drawings, whose dates all link up to significant dates in Abbie’s life as a witness. The horseman, who now has a head and a motorcycle, breaks up their conversation. They lead him to J Street, but Crane gets his foot stuck in supernatural goo. They manage to escape with help from Diana’s gun, but she is still not happy about Molly’s involvement in the supernatural world. Crane warns her that she cannot escape this, but she leaves anyway. The episode ends with Crane attempting to make is apartment more livable when he hears a noise in his closet. Upon investigating, something jumps out at Crane ending the episode with us wondering what happened to him? Also, Dreyfuss makes a deal to work with the horseman, which brings up the question of what Dreyfuss’ motivation is and what he wants? Sleepy Hollow airs Fridays at 9/8c on FOX.